He sat in the shade of the lodge, smoking his pipe. His face was thin, keen, and very expressive. The clear brown of his skin was - pleasant to see, and his hair, wavy from long confinement in braids, was glossy as a blackbird's wing. Around his neck he wore a yellow kerchief - yellow was his "medicine" color - and he held a soiled white robe about his loins. He was about fifty years of age, but seemed less than forty. He studied me quizzically as I communi­cated to him my wish to hear the story of his life, and laughingly muttered some jocose remark to his pretty young wife, who sat near him on a blanket, busy at some needle­work. But the humorous look passed out of his face as he mused, the shadows lengthened on the hot, dry grass, and on the smooth slopes of the buttes the sun grew yellow. After a long pause, he lifted his head and began to speak in a low and pleasant voice. He used no gestures, and his glance was like that of one who sees a small thing on a dis­tant hill. "I am well brought up," were his first words. 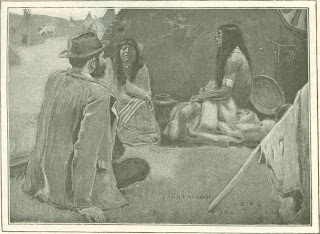 "My father was chief medicine-man of his tribe, and one who knew all the stories of his peo­ple. I was his best - loved son, and he put me into the dances of the warriors when I was three years old. I car­ried one of his war-bonnet feathers in my hand, and was painted like the big war­riors. "When my father wished to give a horse to the Cut-throat or Burnt-thigh people who visited us and danced with us, he put into my hands the little stick which counted for a horse, and I walked across the circle by his side and handed the stick to our friend. Then my mother was proud of me, and I was glad to see her smile. 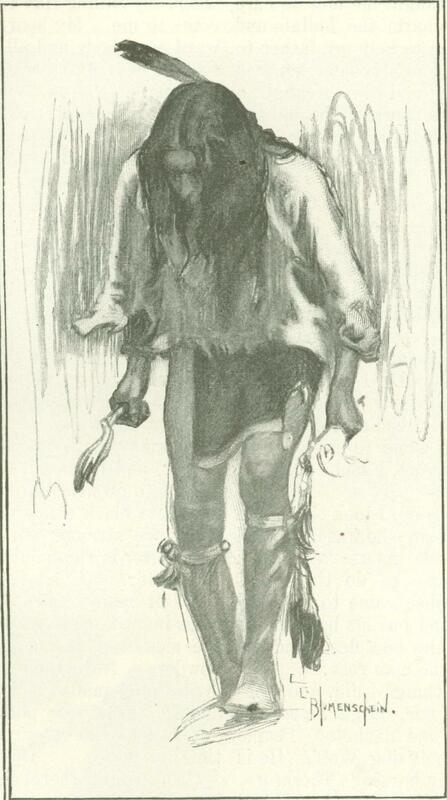 "My father made me the best bows, and my mother made pretty moccasins for me, covered with bright beads and the stained quills of the porcupine. I had ponies to ride, and a little tepee of my own in which to play I was chief. "When I was a little older, I loved well to sit near my father and the old men and hear them tell stories of the days that were gone. My father's stories were to me the best of all, and the motions of his hands the most beautiful. I could sit all day to listen. Best of all I liked the stories of magic deeds. "Thereafter I watched everything the medicine-men did. I crept near, and listened to their words. I followed them with my eyes when they went aside to pray. Where magic was being done there was I. At the dance I saw my father fling live squirrels from his empty hand. I saw him breathe smoke upon the body of a dead bird, and it awoke and ran to a wounded man and tore out the rot­ting flesh and cured him. I saw a mouse come to life in the same way. I saw the magic bladder move when no one touched it; and I saw a man buried and covered with a big stone too great for four men to lift, and I saw him come forth as if the stone were a blanket. I am a poor man. I want to be wise. I want to be big medicine-man. I want to be honored among my people. Help me get blankets, horses. Help me raise my children. "So he chanted many hours, without food or water, and it was cold also. At last he fell down in a sleep and dreamed. When he came home, he had medicine. A big bird had told him many secrets. "Another went into a sweat-house to purify himself. He stayed all night inside, crying to the Great Spirit. He, too, dreamed, but he did not tell his dreams. "Nevertheless I insisted, and he promised that, when I became sixteen years of age, he would help me to become like Spotted Elk. This pleased me. "As I grew older I put away in my mem­ory all the stories my father knew of our people. I listened always when the old men talked. I watched the medicine-men as they smoked to the Great Spirits of the world. 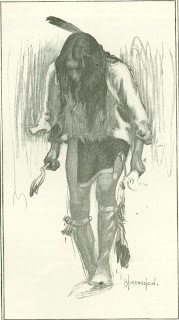 I crept near, and heard them cry to the Great Spirit overhead and to the Dark One who lives below the earth. I listened all the time, and by listening I grew wise as an old man. 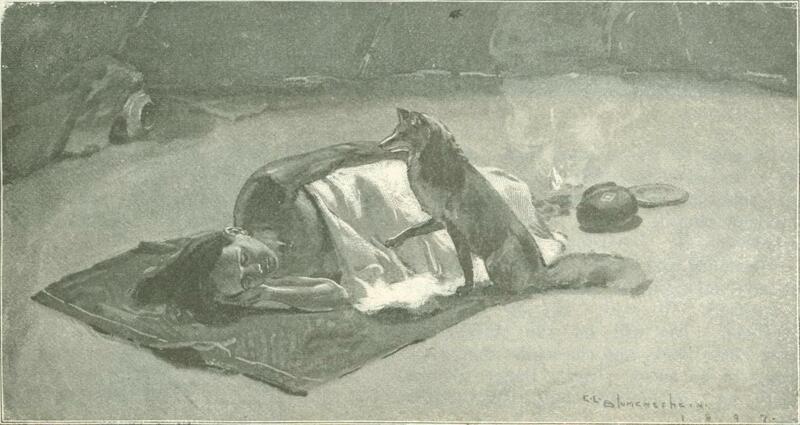 "I knew all the wonderful stories of the coyote and of the rattlesnake. I knew what the eagle said to his mate, and I knew the power of the great bear who sits erect like a man. I was a hunter, but I followed the game to learn its ways. In those days we were buffalo-eaters. We did not eat fish, nor fowl, nor rabbits, nor the meat of bear. Our women pounded wild cherries and made cakes of them, and of that we ate sometimes, but always we lived up­on buffalo meat, and we were well and strong, not as we are now. "I learned to make my own bows and also to make moccasins, though that was women's work, and I did not sew beads or paint porcupine quills. I wanted to know all things - to tan hides, to draw pictures - all things. "By and by time came when I was to become a medicine-man. My father took me to Spotted Elk, the greatest of all medicine-men, he that could make birds from lumps of meat and mice from acorns. Hear me - 0 hear me! You are here in the tepee. Hear me, for I am poor and weak. I wish to be great medicine-man. I need horses, blankets. I am a boy. I wish to be great and rich. "All night, all next day I cried. I grew hungry and cold by and by. I fell asleep; then came to me in my sleep a fox, and he opened his mouth, and talked to me. He told me to put weasel-skin full of medi­cine, and wear fox-skin on my head, and that would make me big medicine. Then he went away, and I woke up. "When I was fed, I took my bow and arrow and went forth to kill a weasel. When I was alone, I sat down and prayed to the Great Spirits of the six world directions, and smoked, beginning at the southeast, and a voice came in my ear which said, I will lead you.' Soon I came upon a large, sleeping weasel; he was white all over as snow, though it was yet fall. 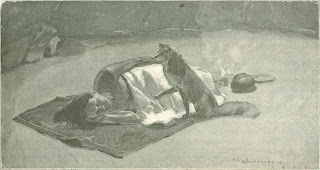 Him I killed and skinned, and stretched the pelt on a flat stick to make a pouch. Then I sought the medicine to go in it. What that was I will not tell, but at last it was filled, and then I slew a big red fox, and out of his fur I made my cap. "Each night I went into my tepee alone to smoke and chant, and each night strange birds and animals came to me and talked and taught me much wisdom. Then came voices of my ancestors, and taught me how to cure the sick and how to charm the buffalo and the elk. Then I began to help my father to heal the sick people, and I became honored among my companions; and when I caught a maid on her way to the spring, she did not struggle; she was glad to talk with me, for I had a fine tepee and six horses and many blankets. "When they did as I bid, I took the mouse and put it before the man who was dead, and I blew smoke upon the mouse and said: Great Spirits, help me to do this great magic.' Then the mouse came to life, and ran to the dead man and put his beak in the hole, and pulled out the bad flesh, and the wound closed up and the man rose. "These wonderful things I did, and I be­came rich. I had a fine, large tepee and many horses and skins and blankets. People said, See, there goes Rising Wolf. He is young, but he has many horses.' Therefore, I came to be called Many Horses; but I had only one wife, Sailing Hawk. I cared only for her." The chief's handsome face had long since become grave and rapt. Now it suddenly grew grim. His little wife moved uneasily in her seat by his side, and he looked at her with a strange glance. Between them had crept the shadow of Sailing Hawk's death. 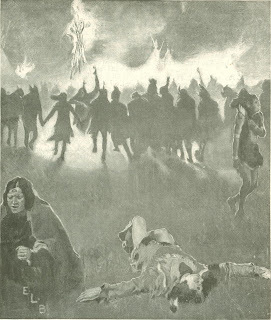 "One day while I sat with Sailing Hawk in my tepee, a big, black cloud came flying out of the west like an eagle, and out of it the red fire stabbed and killed my wife and set my tepee on fire. My heart was like ice when I rose and saw my Sailing Hawk dead. I seized my gun. I fired many times into the cloud. I screamed at it in rage. My eyes were hot. I was crazy. At last I went away, but my wife was dead, and my heart empty and like ashes. I did not eat for many days, and I cared no more for the Great Spirits. I prayed no more. I could not smoke, but I sat all night by the place where my Sailing Hawk lay, and no man dared come to me. My heart was very angry to­ward everybody and all things. I could not see the end of my trail. All was black be­fore me. "My people at this time were living on their own lands. The big fight with Long Hair had passed away, and we were living at peace once more; but the buffalo were passing away, and we feared and wondered. "Then the white man came with his sol­diers, and made a corral here in the hot, dry country, and drove us therein, and said, 'If you go outside we will shoot you.' Then we became poor. We had then no buffalo at all. We were fed poor beef, and had to wear white men's clothes which did not fit. We could not go to hunt in the mountains, and the land was waterless and very hot in summer, and we froze in winter. Then there were many sick, but the white men sent a doctor, and he laughed at me, and ordered me not to go near the sick ones. 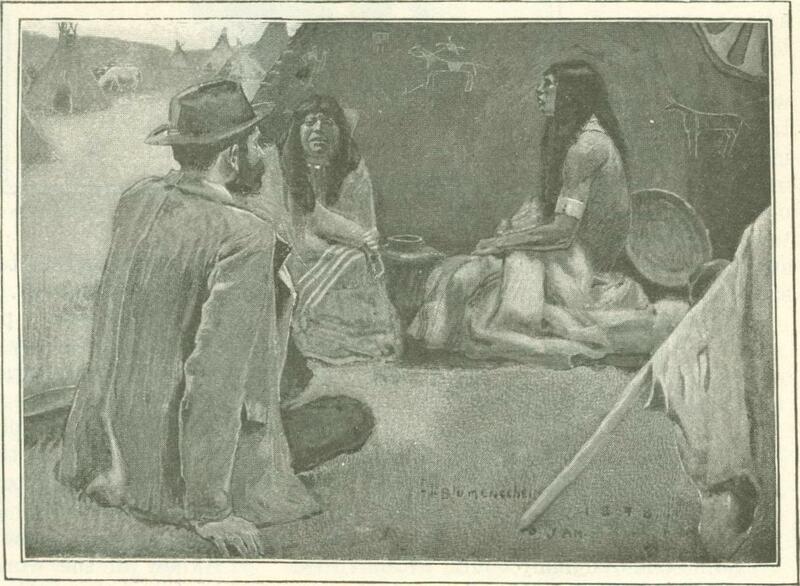 This made my heart black and sorrowful, for the white man gave strange white powders that were very bitter in the mouth, and the people died thereafter. "But many times when he had gone I went in and made strong magic and cured the sick, and he thought it was his white powders. Nevertheless, more and more of my people came to believe in the white man, and so I grew very poor, and was forced to get rations like the rest. It was a black time for me. "All this was unknown to the agent, and at last, when the time came, four of us set forth at night on our long journey. On the third day two Snake chiefs and four Burnt-thighs joined us, then four Cut-throat peo­ple, and we all journeyed in peace. At last we came to the lake by the pictured rocks where the three snow mountains are. "My people, before the white man came you were happy. You had many buffalo to eat and tall grass for your ponies. You could come and go like the wind. When it was cold, you could go into the valleys to the south, where the healing springs are; and when it grew warm, you could return to the mountains in the north. The white man came. He dug the bones of our mother, the earth. He tore her bosom with steel. He built big trails and put iron horses on them. He fought you and beat you, and put you in barren places where a horned toad would die. He said you must stay there; you must not hunt in the mountains. "Then he breathed his poison upon the buffalo, and they disappeared. They van­ished into the earth. One day they covered the hills, the next nothing but their bones remained. Would you remove the white man? Would you have the buffalo come back? Listen and I will tell you how to make great magic. I will teach you a mystic dance, and then let everybody go home and dance. When the grass is green, the change will come. Let everybody dance four days in succession, and on the fourth day the white man will disappear and the buffalo come back; our dead will return with the buffalo. "The earth is old. It will be renewed. The new and happy world will slide above the old as the right hand covers the left. "You have forgotten the ways of the fathers; therefore great distress is upon you. You must throw away all that the white man has brought you. Return to the dress of the fathers. You must use the sacred col­ors, red And white, and the sacred grass, and in the spring, when the willows are green, the change will come. "This seemed good to them, and we all smoked the pipe and shook hands and took our separate trails. 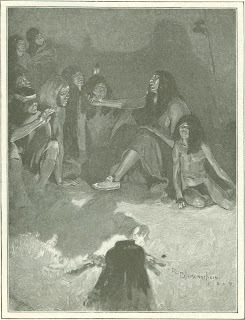 The Blackfeet went north, the People-that-click-with-their­-tongues went west, and the Magpies, the Cut-wrists, and the Snakes started together to the east. The Burnt-thighs kept on, while the Magpies and the Cut-wrists turned to the northeast. "At last we reached home, and I called a big dance, and at the dance I told the people what I had seen, and they were very glad. 'Teach us the dance,' they cried to me. "Then they did as I bid, and when the moon was round as a shield, we beat the drum and called the people to dance. "Then the white man became much ex­cited. He called for more soldiers every­where to stop the dance, so I heard after­ward. But the people paid no attention, for was not the white man poor and weak by the magic of the dance? Father, have pity on us. We have nothing to eat. Take pity on us, 0 Father! "On the fourth night, while we danced, soldiers came riding down the hills, and their chiefs, in shining white hats, came to watch us. All night we prayed and danced. We prayed in our songs. You are close by in the dark. Hear us and help us. Take away the white man. We are poor and weak. We can do nothing alone. "As the sun came near we all danced hard. My voice was almost gone. My feet were numb, my legs were weak, but my heart was big. 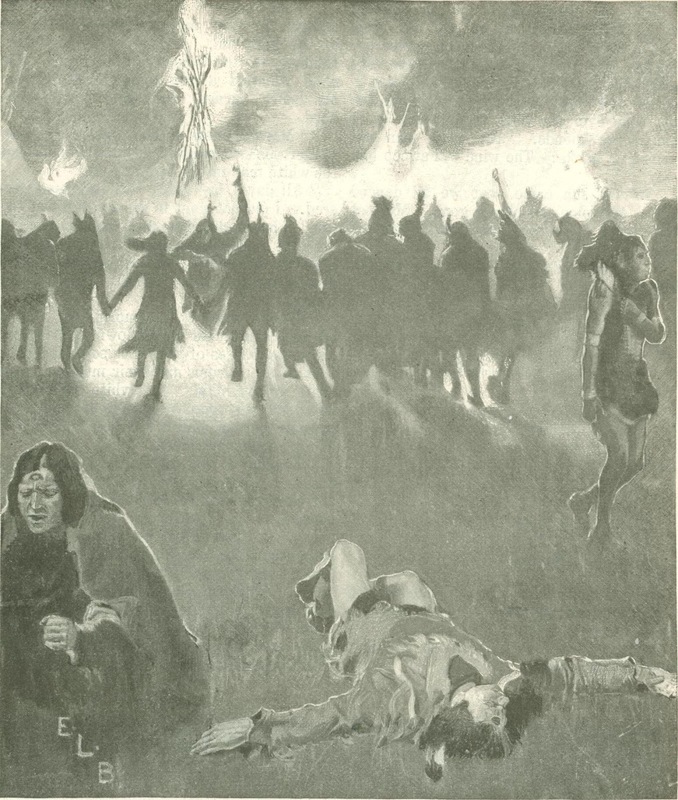 "Oh, help us, Great Spirits,' we cried in despair. Look on us, for we have danced until daylight. 0 Father, the morning star! Show us our dead ones. We hold out our hands to you and cry. "Then I covered my head with my blanket and ran far away, and I fell down on the top of the high hill. I lay there a long time, thinking of the white man's laugh. The wind whistled a sad song in the grass. My heart burned, and my breath came hard. "All day I lay there with my head cov­ered. I did not want to see the light of the sun. I heard the drum stop and the singing die away. Night came, and then on the hills I heard the wailing of my people. Their hearts were gone. Their bones were weary. "When I rose, it was morning. I flung off my blanket, and looked down on the valley where the tepees of the white soldiers stood. I heard their drums and their music. I had made up my mind. The white man's trail was wide and dusty by reason of many feet passing thereon, but it was long. The trail of my people was ended. "I said, I will follow the white man's trail. I will make him my friend, but I will not bend my neck to his burdens. I will be cunning as the coyote. I will ask him to help me to understand his ways, and then I will prepare the way for my children. Maybe they will outrun the white man in his own shoes. Anyhow, there are but two ways. One leads to hunger and death, the other leads where the poor white man lives. Be­yond is the happy hunting-ground, where the white man cannot go.' "
Originally published in McClure’s Magazine in June of 1899.